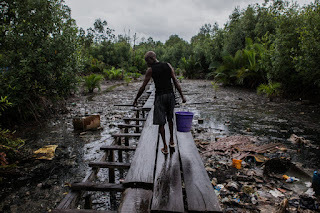 UGBORODO, NIGERIA (NEW YORK TIMES) — Militants are roaming oil-soaked creeks in the south, blowing up pipelines and decimating the nation’s oil production. Islamist extremists have killed thousands in the north. Deadly land battles are shaking the nation’s center. And a decades-old separatist movement at the heart of a devastating civil war is brewing again. On their own, any one of these would be a national emergency. But here in Nigeria. they are all happening at the same time, tearing at the country from almost every angle. Mr. Buhari took office a year ago, promising to stamp out terrorism in the north and to rebuild the nation’s economy. But he has been knocked off course by a series of crises across the country, forcing him to toggle between emergencies. Beyond low prices for the nation's oil, the source of more than 70 percent of the government’s revenue, Nigerian officials have been tormented by a new band of militants claiming to be on a quest to free the oil-producing south from oppression. They call themselves the Niger Delta Avengers. Despite their name, which sounds as if it might be out of a comic book, the militants have roamed the waters of the south for six months, blowing up crude oil and gas pipelines and shattering years of relative peace in the region. As a result, Nigeria’s oil production in the second quarter this year dropped 25 percent from the same period a year earlier — enough to contribute to a slight increase in global oil prices, according to an analysis by Facts Global Energy, a consulting firm in London. Partly because of the Avengers and their sabotage, Nigeria has fallen behind Angola as Africa’s top oil producer. The attacks have been so costly that Mr. Buhari sent troops that had been fighting in the north against Boko Haram — the extremist group that has killed thousands and forced more than two million people to flee their homes — to battle the Avengers in the south instead. Mr. Buhari then reconfigured those efforts after complaints that marauding soldiers had roughed up people and property while looking for militants in the south, creating even more resentment among the impoverished people who live there. Militants have struck in the south in the past, kidnapping or killing oil workers and police officers to demand a greater share of the nation’s oil wealth. But the Avengers seem bent on crippling Nigeria’s economy while it is particularly fragile, striking at the core of Mr. Buhari’s plans for the nation. The Avengers have sent oil, power and gas workers fleeing, torturing the multinational companies that burrow for oil underneath the waters. Fuel deliveries around the country have stalled, because almost everything that has to do with oil in Nigeria right now has been tangled up by the militants. On the main highway in the southern port city of Warri recently, a long row of fuel tankers sat on the side of the road, idle. A bent-back windshield wiper served as a makeshift clothesline. A mini tube of toothpaste rested on the dashboard of one truck. The truckers were stranded, waiting to fill up. They had been there a month. Mr. Buhari’s government has said it is open to negotiating with the group. But it is already stretched thin. On the opposite side of the country, Boko Haram is still raging. Mr. Buhari has started a major offensive against the group that has made progress, but it has yet to stamp out the violence. Another longtime battle is flaring in the middle of the country, between farmers and nomadic Fulani herdsmen looking for grazing pastures. Hundreds have been killed in battles as herdsmen roam into new territory to look for vegetation for their cattle. Officials have blamed climate change and the nation’s rapidly growing population for the scarcity of pastureland. And with their demands for economic equality for the south, the Avengers have been trying to stoke the aspirations of separatists elsewhere in the nation. More than four decades ago, at least one million people were killed during the Nigerian civil war, when separatists led an uprising that created an independent republic of Biafra in the southeast. It lasted three years, until 1970. Now, a Biafran separatist movement is simmering again, with the police and protesters clashing regularly since October, when a prominent activist was arrested and jailed. Some have accused the Nigerian security forces of seeking out and killing protesters. The Avengers are fanning the separatist sentiments, invoking the Biafran movement and calling for a “Brexit”-style referendum to split the nation along several fault lines. The south has long been a reservoir of anger and resistance, a place where countless billions in oil revenue are extracted for the benefit of distant politicians and companies abroad. Yet drinking water and electricity can be scarce, and the swamps people live around are regularly polluted with Exxon Valdez-sive spills, casting an oily sheen on the creeks and coating the roots of dense mangroves in black goo. Many people in the predominantly Christian south say they believe that Mr. Buhari, a Muslim from the north, is neglecting them for political or sectarian reasons, even though conditions were also grim under his predecessor, Goodluck Jonathan, a Christian southerner. In his recent speech, Mr. Buhari recalled the horrors of the civil war, when he served in the military fighting Biafrans. “The president has a vision of one united Nigeria and is prepared to do everything to keep it as one,” he said. This spring, Mr. Buhari announced that he would personally introduce a $1 billion cleanup program of the oil-polluted Niger Delta area. It was to be Mr. Buhari’s first visit to the region since taking office, but with the Avengers’ movement raging, the president abruptly canceled his trip. Residents of Delta State felt slighted. Yet many Niger Delta residents like Mr. Gbalibi oppose the Avengers because their acts of sabotage have degraded the already-poor quality of life in the region. Spills from explosions have further polluted farmland and fishing holes. Mr. Gbalibi and his fuel truck were among those stuck on the side of the highway for a month because the Avengers had disrupted fuel distribution. About a decade ago, another band of militants, the Movement for the Emancipation of the Niger Delta, prowled the creeks, blowing up pipelines. The federal government reined it in by setting up an amnesty program that offers cash and job training, some of it overseas, for more than 30,000 militants and residents, according to Paul Boroh, a retired brigadier general and the special adviser to Mr. Buhari for the program. But oil revenue finances the program, and the fall in oil prices prompted the president to consider ending the amnesty program at the end of last year. Mr. Boroh said he had lobbied to keep the plan for now, but to phase it out over the next two years. The Avengers movement sprang up around the time the president was considering an end to the program, prompting many Niger Delta residents to wonder if the shadowy group is made of former militants hoping to keep up amnesty payments. The amnesty program is far from universally loved in the creeks. Many residents say payments are routinely siphoned by corrupt community leaders. Others say the job training they received was virtually useless. Oil companies prefer to hire foreigners, they complain, or they hire locals only on a short-term basis — and then nothing. The program sent Mike Gomero, a former militant, to learn the teachings of Mohandas K. Gandhi and the Rev. Martin Luther King Jr. at a two-week session in South Africa. He is no longer blowing up pipelines. But he still does not have a job. 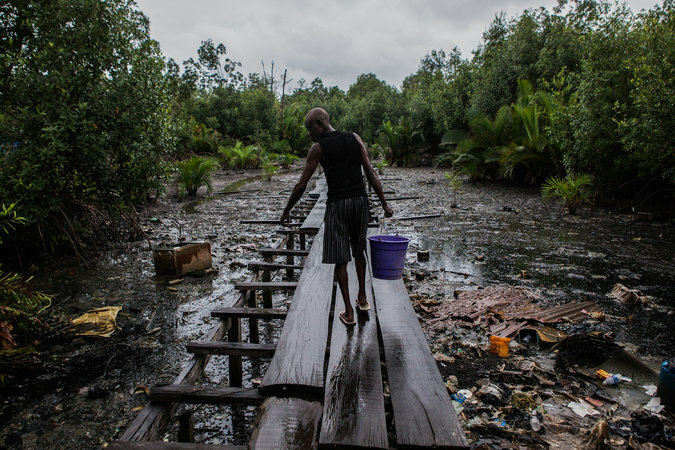 Communities like Ugborodo, so deep in the winding creeks that it is at least two hours from the mainland by speedboat, are dotted with homes that are little more than tiny zinc huts on islands that are sinking into the sea. They are filled with unemployed residents trained as geologists, pipe fitters and marine engineers. One of them, Collins Bemigho, stood along a dirty swamp, orange flares from a giant Chevron terminal glowing in the distance behind him. He complained about a lack of indoor plumbing, of good health care or a secondary school, and then pointed to a thick pipe jutting from the water.